The otolith, an aragonite crystal found in the labyrinth of the inner ear, functions mainly as an aid to the balance and hearing of teleost fishes. The morphology of otolith is species-specific and useful for the identification of fishes. This method is widely applied to systematics, fishery biology, trophic ecology, paleontology and archaeology. In this book “Otolith Atlas of Taiwan Fishes”, a total of 1004 species belonging to 30 orders, 165 families, and 488 genera are presented. The otolith images and descriptions as well as information for voucher specimens of this book are also contained in a comprehensive database with identical title in this webpage (http://oto.nmmba.gov.tw) (http://oto.biodiv.tw). In addition, this website also contains 400 otolith specimens from ASIZ museum , these photos are not included in the book, Now 1,102 species were included in this website, 98 more than the book. Profound and genuine dedication for the promotion of knowledge in all aspects of marine life from biodiversity to biotechnology, encompassing academic research, exhibition, scientific education, and specimen collection are the main principles and mission for the National Museum of Marine Biology and Aquarium. From these scopes, the NMMBA strives for a well executed and proceeded research that is mostly derived from comprehensive and fundamental collections for years. 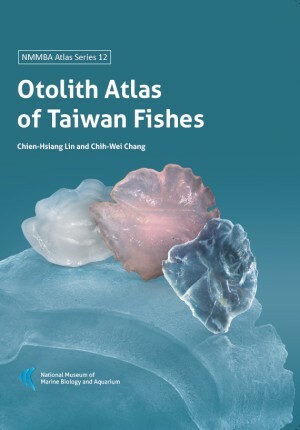 The “Otolith Atlas of Taiwan Fishes” is an excellent paradigm in combining great efforts on both research and collection from the authors, Chien-Hsiang Lin and Chih-Wei Chang, for over a decade. Aside from the otoliths collected intentionally from the fish that inhabit specific habitats, a vast variety of otoliths were also obtained in association with the samplings from several well organized studies. Most importantly, the completion of an otolith atlas with over 1000 species serves as a critical keystone being definitely significant and beneficial to the consequent implications on fish systematics, fisheries biology, trophic ecology, paleontology, and archaeology. The great impact and multidisciplinary achievements of this work are among the goals NMMBA long-termedly pursuits for the enhancement of our understanding on the interrelationship among the fascinating marine life. Here I would like to express my greatest appreciation to both of them for their keen efforts and contributions. I certainly believe that this atlas is a useful guidebook to any study that is related to otolith morphology. It is my great honor and pleasure to be invited by Chih-Wei Chang to write this Preface for the new book of “Otolith Atlas of Taiwan Fishes” by him and his colleague, Chien-Hsiang Lin. This book can be regarded as a milestone since it shows that the ichthyological studies in Taiwan these days are quite advanced in the world. In the past, the majority of fish books published in Taiwan were written in Chinese and belonged to encyclopedia or guide book style. They are mainly for popular use and not really for academic purposes. But this otolith book will be used mostly by scientists for species identification (taxonomists), life history and feeding habit studies (ecologists), fishery resources management (fishery biologists), and ancient culture findings (paleontologists). The quantity and quality of the book's content are outstanding. It covers more than one thousand species, which makes it the most complete book among the world's existing otolith books. It will become one of the most important tool-books for ichthyological studies in Taiwan and the world. One of the reasons these authors can collect so many otoliths is that Taiwan has high fish species diversity, with more than 3000 species. Another important factor is the authors’ dedication and great effort working on the TELDAP (Taiwan e-Learning and Digital Archives Program) in the past three years. It takes a lot of time and hard work to collect these otoliths: starting from fish specimen collection, identification and dissection; and then otolith preparation, morphology description, and both stereo microscopy and scanning electronic microscopy photos for each otolith. Chang is fortunate to have received three-year grant from National Science Council to carry out this TELDAP project. The funding enabled the authors to accomplish their task through the establishment of a database and website. Their well-designed database makes publishing or printing out its content quite easy and efficient. As the Coordinator of the Biodiversity Theme for TELDAP, I am really happy to see this book is published and I wish to congratulate both Chang and Lin for their excellent work and great contribution to TELDAP.